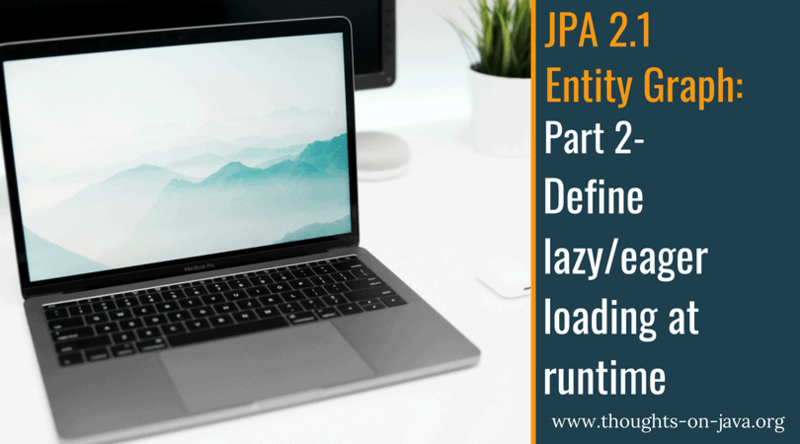 This is my second post on Entity Graphs, one of the features introduced with JPA 2.1. The first post described the usage of named entity graphs. These can be used to define a graph of entities and/or attributes at compile time that shall be fetched with a find or query method. Dynamic entity graphs do to the same but in a dynamic way. This means you can use the EntityGraph API to define your entity graph at runtime. We will use the same example as in the previous post. So you can skip this paragraph if you have read the other one. We will use 3 entities. These are Order, OrderItem and Product. An Order might include multiple OrderItems and each OrderItem belongs to one Product. The FetchType of all these relations it FetchType.LAZY. So the entity manager will not fetch them from the database by default and initialize them with a proxy instead. So lets define a dynamic entity graph. We will do the same as in the first post and define a simple entity graph that tells the entity manager to fetch an Order with all associated OrderItems. Therefore we use the createEntityGraph(Class rootType) method of the entity manager to create an entity graph for the Order entity. In the next step, we create a list of all attributes of the Order entity that shall be fetched with this entity graph. We only need to add the attribute items, because we will use this entity graph as a loadgraph and all other attributes are eager by default. If we would use this entity graph as a fetchgraph, we would need to add all attributes to the list that should be fetched from the database. OK, dynamically defining which attributes of an entity shall be fetched from the database is nice. But what if we need a graph of entities? Like fetching an Order with all its OrderItems and their Product? This can be done with a sub graph. A sub graph is basically an entity graph that is embedded into another entity graph or entity sub graph. The definition of a sub graph is similar to the definition of an entity graph. To create and embed the sub graph into an entity graph, we need to call the addSubgraph(String attributeName) method on an EntityGraph object. This will create a sub graph for the attribute with the given name. In the next step, we need to define the list of attributes that shall be fetched with this sub graph. The following snippet shows the definition of an entity graph with an entity sub graph which tell the entity manager to fetch an Order with its OrderItems and their Product. 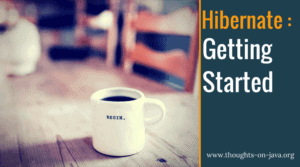 As in the previous post, we want to have a look at the hibernate log and find out what hibernate is doing. As we can see, the result of a dynamic entity graph is the same as of a named entity graph. It creates a load plan and one select statement with all 3 entities. After defining a named entity graph in the first post, we now used the EntityGraph API to define an dynamic entity graph. Using this entity graph, we can fetch a graph of multiple entities with only one query from the database. This can be used to solve LazyInitializationException and to improve the performance applications. What do you think about (dynamic) entity graphs? From my point of view this is a very useful extension compared to JPA 2.0. Especially the dynamic entity graphs are useful to define your fetch strategy based on runtime information like method parameters. If you enjoyed reading this article and like to learn more about other Java EE7 features, make sure to subscribe to my RSS feed or follow me on twitter and google+. I'm really very curious where this whole Annotatiomania™ leads us. Once we declare something like a named entity graph with declarative tools like annotations, I really start wondering why we have stopped writing SQL. I understand that this whole set of features will go through a variety of caches in Hibernate and leverage the whole platform. But the sheer complexity of a project that yields hundreds of such entity graphs makes me think if querying shouldn't better be done with the optimal query language for RDBMS. Have you already seen these JEE7 things in the wild? No, I have not seen it in a “real” project so far. But that will change as soon as critical applications switch to JEE7 application servers. But it would be similar with predefined SQL statements. You have to put the predefined stuff somewhere in the end. Independent of your approach to define a database query, structuring a hughe application is not an easy job. And I don't think, that there is a one size fits all approach. You always need to find the best solution for your current application. I really like this artikle. But as my company is still unsing JPA 2.0 and I am new in this field: Is everything also possible with JPA 2.0?